We already knew that there were 4,588,252 people living in Ireland last year – but the latest batch of CSO Census data means that now we literally know where you live. A graphic from the CSO shows the population density in various areas of Ireland. THE SOUTH DUBLIN town of Saggart has been unveiled as Ireland’s fastest-growing town, in new figures published by the Central Statistics Office. The town’s population grew from 868 in the 2006 census to 2,144 - a change of 147 per cent in the intervening five years. Courtown Harbour in Wexford had the second-highest growth, rising up to 2,857 last year from 1,421 in 2006 – a rise of 101 per cent. Another town in the South Dublin jurisdiction is the third fastest-growing town – Newcastle’s population has grown by 77 per cent in the five years between censuses; its population of 2,659 in last April’s census is up from the 1,506 it had recorded six years ago. Carrigtwohill is fourth, and the fastest-growing town in Munster: the Co Cork town has seen its population spike from 2,782 to 4,551 in five years, a boost of 64 per cent. Ballymahon, Co Longford, is fifth with a rise from 963 to 1,563 - an increase of 62 per cent. Drogheda remains Ireland’s most populous town, with 38,578 inhabitants, ahead of Dundalk at 37,816. Swords has a population of 36,924, ahead of Bray (31,872) and Navan (28,559). Dublin areas rank highly in the most densely populated towns, with towns in the Fingal jurisdiction occupying the top three places. Kinsealy-Drinan is the most densely populated, at 5,101 per square kilometre, ahead of Lusk and Swords. Sallins in Kildare has the highest density outside the capital, at 3,596, while Donabate, the overall Dublin city area, and Bray also rank highly among the most densely-populated areas. By comparison, Leitrim has the most rural population in the country: fewer than one-in-ten people in the county live in an urban area. The population of all five of Ireland’s cities has risen since 2006: the population of Dublin city and its suburbs now stands at 1,110,627, up by 6.2 per cent on the 2006 census. 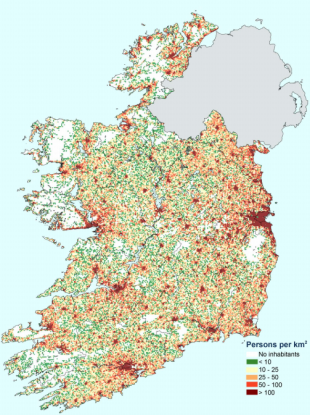 39 per cent of Ireland’s urban population lives in the capital’s environs. Cork’s population is up by 4.3 per cent, to 198,582, while the population of Limerick is up by a relatively modest 0.2 per cent to 91,454. The numbers living in Galway are up by 5.6 per cent to 76,778, while the numbers in Waterford are up by 4.7 per cent to 51,519. In all of the above examples, the figures include the inhabitants in city suburbs outside of city council areas. Laois has the highest-growing population of any county in Ireland, with growth of some 20.1 per cent – up from 67,059 in 2006 to 80,559 between censuses. Cavan and Fingal are next, with growth of 14.3 per cent (to 73,183) and 14.2 per cent (to 273,991) respectively. Indeed, most of Leinster has seen the highest population growth, with Longford, Meath, Kildare and Louth next on the list, before Cork County’s 10.5 per cent breaks the eastern stranglehold. Only two jurisdictions have seen their population fall: the territory of Cork City Council is down down by a mere 188 people, or 0.2 per cent, to 119,230, while Limerick City Council’s population is down by 4.5 per cent (2,684 people) to 57,106. In both of those cases, however, stats elsewhere show that the population of the overall city and its suburbs have increased, so the figures indicate that people are simply choosing to live in more suburban areas of those two cities. A full list of population growth by county, city and province is included in the gallery below. Email “Census 2011 reveals Ireland's fastest-growing towns and counties”. Feedback on “Census 2011 reveals Ireland's fastest-growing towns and counties”.